Domitian erected the Arch of Titus ca. AD 81 to commemorate the consecratio, or official deification, of his deceased brother Titus. Located in the Roman Forum at the foot of the Palatine Hill, the Arch of Titus enjoyed the most impressive backdrop in Flavian Rome, the Colosseum, which Titus had dedicated in AD 80. 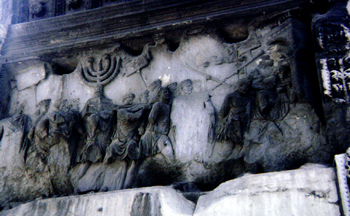 The three themes of visual propaganda introduced in the Pentelic marble relief sculptures of the Arch of Titus--imperial apotheosis, equality between emperors and deities, and military triumph over Judaea--were echoed in later Domitianic official monuments, including the Templum Gentis Flaviae. The primary text of the arch is the apotheosis of Titus. Its most explicit expression is appropriately located in the vault of the archway. Here the deified Titus is borne aloft by a giant eagle, symbol of Jupiter and Rome. This image captures the climactic moment in the state funeral of Titus, the instant when his consecrated soul ascended to heaven directly from the funeral pyre. In imperial funerals of the 2nd and 3rd centuries AD, a live eagle was released from the flaming pyre to symbolize the miracle of apotheosis. Arch of Titus, Rome. Titus in triumph, accompanied by Victory. 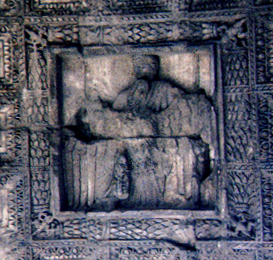 The deification of Titus is also the subtext in one of two pendant relief panels in the passageway of the arch. Both sculptures recreate the spectacular triumph celebrated by Vespasian and Titus in honor of their conquest of Judaea. One scene, however, is charged with allusions to the divine status of Titus. In this panel, Titus as triumphator presides over the victory procession in a four-horse chariot. The Romans believed that, for the duration of the procession, a triumphator achieved temporary apotheosis as the incarnation of Jupiter. The Roman triumph followed a fixed route through the city, mustering in the Campus Martius and traversing the Circus Maximus and the Roman Forum before reaching its final destination--the Temple of Jupiter Optimus Maximus on the Capitoline Hill, where the triumphator surrendered his ephemeral godhead. Not only is Titus portrayed as a deified triumphator; he also interacts as an equal with gods and divine personifications of abstract imperial virtues. 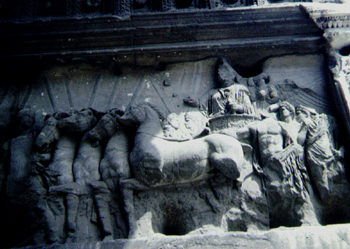 A goddess who symbolizes Rome or Military Valor leads the emperor's chariot; his figure is surrounded by personifications of Victory and Honor. The fluent interaction between Titus and these divinities implies that they accept divus Titus, the deified Flavian emperor, as their peer for eternity, not just on the day of his triumph. Arch of Titus, Rome. Triumphal procession with spoils from Jerusalem. In contrast to the universalist message of imperial deification that underlies the triumph panel of the Arch of Titus, the spoils panel across the passageway reflects the Roman penchant for documentary historicism. Here the action takes place on a purely human plane; the participants are all mortals, part of a vibrant parade that streams through an arch on the triumphal route. The scene is dominated by a huge candelabrum, the exotic emblem of all the treasures looted from the Temple in Jerusalem by the legions of Titus. This descriptive specificity identifies the event and anchors it firmly in a particular time and place--the Flavian triumph over Judaea celebrated by Vespasian and Titus in Rome in AD 71. This was the only triumph in which all three Flavians took part: "Vespasian drove along behind the spoils and Titus followed him; Domitian rode beside them, dressed in a dazzling fashion and riding a horse which was worth seeing" (Josephus, Bellum Judaicum VII, 5, 132ff). As such, the conquest of Judaea became a recurrent theme in Flavian dynastic propaganda; among other venues, it was advertised on coins and recalled in the Templum Gentis Flaviae. Copyright ©1997, 2002 Ministero per i Beni Culturali e Ambientali, Soprintendenza Archeologica di Roma and the Kelsey Museum of Archaeology, University of Michigan. All rights reserved.